I am not doing a New Year's Resolution post. I have no resolutions. I am perfect. Okay, but really - I hadn't given it as much thought as I usually do. I will always want to lose weight, and I'll always start out strong in January and then get bored by March. My head is buzzing with goals and thoughts and excitement about the prospect of a new year. In the most basic of terms, I'd like to learn to do and finish things as much as I dream of them. But, I am pretty sure I just summed up the rest of my life. Clearly I am still working through this. I have been a reading machine as of late and I've been transported to different lives and times and places and I'd love for you to know about them too - this did start out as a travel blog, after all. A special thanks to Bryan who told me I needed to stop buying the internet on the plane ride up to New York, because I get to read a lot and we save money. This book made me want to bash my head into a wall. Mostly, because when words fail me I have this tendency to rest heavily on macabre physicality in order to convey my overwrought emotions. Suspense isn't usually a genre I am inclined toward, but the cover and description is just enigmatic enough to leave my interest piqued. The fact that I was close 736579 on the waiting list at the library for it only made me more determined to figure out what the fuss was about. I happened to find it at the library as a part of the "quick pick" special, where you can borrow it as long as you read it and return it in a week. BASICALLY, IT IS COMPLETELY JACKED UP AND IT WILL ONLY MAKE YOU CUSS. Never have I been so captivated and enthralled with a story while simultaneously detesting all characters involved. I hated them so much, but I couldn't not know what happened. It's lascivious (you've been warned - I'm not recommending it, content-wise) and the whole time, I wanted to call Gillian Flynn and say, "Girl. How many episodes of SVU and Unsolved Mysteries did you have to watch to come up with this, and did you feel mentally stable when you finished writing it?" For fans of: I have no idea. And for the most polar opposite of Gone Girl, I am in the middle of this book right now - and it's shaking me up in such a great way. It's showing me how my prayers have been too vague. It's reminding me that God is in the business of answering enormous prayers that combat all logic and rationality and let us be a part of a magnificent story. It's a game changer for me. I know I won't be the same when I finish. I am excited for Bryan to read it as well because it's one that is great for conversation. It's great for the type of conversation that leaves you ravished and encouraged and excited to pray. I love those kinds of books. Favorite Quote(s): "I don’t want easy answers or quick answers because I have a tendency to mishandle the blessings that come too easily or too quickly. I take the credit or take them for granted. So now I pray that it will take long enough and be hard enough for God to receive all of the glory. Change your prayer approach from as soon as possible to as long as it takes." After the last book post, the comments almost seemed unanimous in recommendation of this one. Once again, I was late to the game in hearing of this book and trying to get it from the library right away. Thankfully, one of my friends had a copy and I got to read it immediately. I read it in a few hours. I think it's technically young adult (but so was The Book Thief, so no judgment) and everyone said I would cry. That wasn't surprising to me at all, because Google commercials leave me in puddles of tears and it's just not hard to do. In a moment of naivety and pride, I realized I was almost finished and hadn't shed a tear. I was stoic. Then, I fell apart in the last few pages and I felt like a fool. A FOOL! You will love Augustus Waters. You will love him. You will love him. I just told you nothing about the book...whatever, I am not Goodreads. I really did love this, though. For fans of: Google commercials, and an ample amount of quotes that you would have put in your AOL Instant Messenger profile if it was still 2001. My friend Hannah and I are both kind of psychotic book enthusiasts, so I really trust her recommendations. She wrote her own review of it, and I don't know that I could do a better job of describing it like she does. You will want to go find Rick Bragg's mother and embrace her for a long time, and thank her for being an incredible human being. Okay, FULL DISCLOSURE. I saw the trailer for this movie and was enamored because they used that insanely bewitching Florence & the Machine song. And, the cast is of high repute! Once I started reading it, I realized that it was written for a thirteen year old girl that is probably sad Twilight was over. I found myself growing indignant at the elementary writing style, and then I remembered -- "OH YEAH, I'M THE 26-YEAR-OLD THAT IS WILLINGLY READING A PARANORMAL TEEN ROMANCE NOVEL." I then came to my senses and promptly returned the book. Did anyone finish this one? Did I jump ship too quickly? I know this one has been around for a while. I've started it several times, but finally jumped in head first and finished it quickly. I expected to finish feeling exhausted and defeated by the hardships of Walls' childhood, but I wasn't. I was shocked and amazed, and sometimes sad or angry- but overall I was in awe of her resilience. I also had so much respect for her as a writer. She held a lot of power in how her audience would perceive her parents. She told her story explicitly, but I felt really proud of her for loving them so well in their weakness and eccentricity. Are you still there? TELL ME WHAT YOU'RE READING! TELL ME WHAT I SHOULD READ! THINK OF ALL THE WORDS! I am still reading Love Does. Forgive me everyone, I started in August but have since started like seventeen other novels and have not finished one. I am glad you enjoyed "Fault in Our Stars." My 16 year old sister recommended it to me and I'm so glad I read it. I remained mostly composed until the end when I was a sobbing mess. I too loved Augustus. I haven't been swept away by a book in a while (too much nonfiction and theology! ), so it was nice to be transported to another world with people I knew nothing of. Are you going to call Bob Goff and get lunch with him when you finish? Only if you go with me! Bob, Jess, & Fran- an unstoppable trio! Happy to see this post! I've read two of these books and I can't wait to read the others, especially Gone Girl! Let me know what you think of Gone Girl. It was bizaaaarrrooo! Out of these books, I've read Gone Girl (I agree with everything you said. That book is WAAAACKED. ), The Fault in Our Stars (liked it), and The Glass Castle (I read it while ago and remember being fascinated. I liked that one a lot). As for the others... I may give All Over But the Shoutin' a try... ! The Miraculous Journey of Edward Tulane. The only one of those four I've heard of is The Art of Racing in the Rain. I will have to check those out. It's so funny you recommended Edward Tulane -- my aunt was telling me how much I would love it! I will have to read it right away. It looked really sweet. I'm back again. I just read your friend Hannah's review and, yes, I will be reading that book FOR SURE. Tell me what you think of it when you do! WELL The Fault in our Stars was an amazing book and I am so happy you used that part as your title!!! I couldn't get enough of them. Thanks, lovely woman! I am glad anyone else finds them useful. I am LOVING your coffee corner. And I can't stop thinking about the butter coffee. hahahah thank you for appreciating my lack of description! First of all, I love that you review even the books you hate, because I tend to only keep prattling on about the bad ones. Second of all, you make me long for summer when I can take a break from long, depressing, doomed, French tomes thatI have to write papers on and I can read The Good Books. SUMMER COME. Third, my roomie from last year goes to the church where Matt Batterson is the pastor. And finally, you need to read John Irving's A Prayer for Owen Meany. It is kind of long and seemingly pointless (UNTIL YOU GET TO THE END AND REALIZE THAT OUR LIVES ARE BEAUTIFUL AND INTRICATE AND EVERY SINGLE THING MATTERS TO GOD) but it is one of those books that matches the quote from The Fault in our Stars. I am not ready for summer yet - but I'm not really in love with winter, either. For your sake I will hope and wish for it to come sooner. My nana loves A Prayer for Owen Meany...I think I've always been hesitant because I've seen Simon Birch so many times. Isn't that what the movie is based on? Or did I just make that up? Elegance is on my shelf... ughhhhh I AM TRYING I AM. 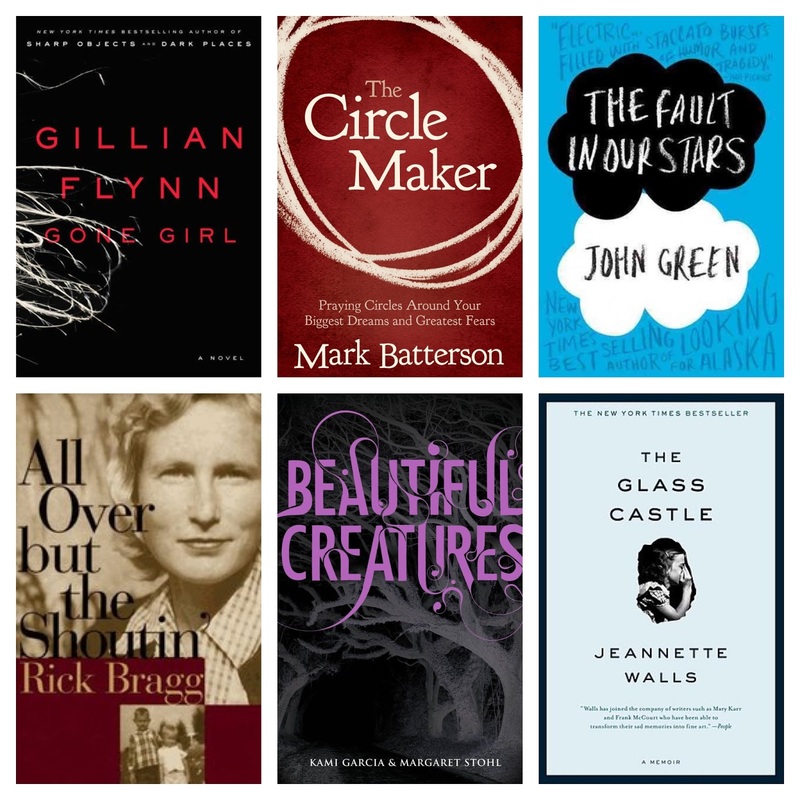 Definitely going to check out The Circle Maker and The Fault in Our Stars. Recent favorites of mine include The Guernsey Literary and Potato Peel Pie Society, The Help, Life of Pi, Gilead, and Heaven is Here. All were wonderful! I have heard so many great things about The Guernsey Literary! Loved The Help and I've started Life of Pi but never got around to finishing it. I'm just catching up on my looooooong "to read" list. Over the past few weeks I've read The Night Circus, Hotel on the Corner of Bitter and Sweet, The Paris Wife, and now I'm in Cutting for Stone. The only one I've LOOOOOOOOVED was The Night Circus, but the other two that I've finished are worth a read as well. Love the book recs! I am SO GLAD YOU READ THE NIGHT CIRCUS!!!! And that you loved it. I am still baffled that it's not more popular. It was just so, so good. I'd like to read it again. I read The Paris Wife, and I started Cutting for Stone. It's hard to get into, though. Mostly because I find myself looking up the meaning of words left and right and it kind of messes with my pacing. I love love love your book reviews. You're hilar and helpful and that is the perfect combination. The Fault in Our Stars sounds perfect because I was totally that girl with the quotes in her AIM away message. YOU KNOW ME. And I have all the cries with the Google commercials. Any sweet commercial actually. Also, have you seen the movie "We Bought a Zoo"? I saw it last year and just got it for Christmas and I'm in love. So in love. Also, I'm 98% sure you've already read it, but if you haven't, "Water for Elephants" is perfect. So so perfect. I'd recommend The Book Thief and History of Love because both of those rocked my world in the best possible way, but I know you've already read them. WHO HASN'T. Dear Sophie is the google commercial that completely annihilates me every time I see it. I loved We Bought a Zoo. Did you read the book? It's a true story, which makes it a million times better. I would love to adopt that tiny girl in the movie, though. She was out of control adorable. I read Water for Elephants a long time ago and LOVED IT. I'm sad to say I think most of my memories of it are now from the movie version which was not as good, but I love Reese Witherspoon and Christoph Waltz so I support it. I will check out her blog, thanks girl! Is Dear Sophie the one with the girl away at college and her dad? Cause I love that one. I didn't know We Bought a Zoo is a book too! Added to my list. And yes yes yes to that little girl. I want one just like her. Yeah, the movie version didn't really do it for me. I don't know if it;s because vampire boy was in it or because they just didn't capture the emotion of the book (in my opinion), but I just reread it for the 3rd or 4th time and fell in love again. Do ittt. I'm so glad that I wasn't the only one that ended up infuriated at the end of Gone Girl! Ah, that book still makes my blood boil and I read it months ago! The Fault in our Stars was one of my favourite books this year and The Glass Castle still haunts me years after reading it. I'm currently reading The Life of Pi - I can't believe that I've never read it and now that the movie is out, I feel like I better get it done before I see it on film. I've started Life of Pi many times and then never finish it. I'd love to finally persevere. Yeah, Gone Girl. I went into it knowing that a lot of people were disappointed with the ending. I think that helped me in a way. I was expecting it to end badly. I don't know what kind of resolution would have pleased me, though...because I didn't want anything good for either of them. Like I didn't care what happened to them and with as jacked up as they both were I think they just deserved each other. UGH. I absolutely loved The Fault in our Stars (although, I'll be honest: I love anything John Green writes)!! Have you read his other books as well? I haven't read any of his other books! The first of his I read was Looking for Alaska - it was recommended by my best friend back when we were in high school. I think that aside from The Fault in our Stars, it's definitely my favorite by him. I think they're his most meaningful books. I'll def be checking out The Fault in our Stars...looks really good and lets be honest, i love a good YA novel! Currently reading The Joy Luck Club...love it so far! One other person commented and suggested Peace like a River, yes, yes and yes! One of the best books i've ever read! I just finished college. And have a baby who, despite my best efforts, falls asleep by 7pm every night. Just went through an unfortunate break up and I tweeted Don Miller today to let him know to hurry it up and publish a new book for me. He assures me a new one is coming soon. Thank you for your well-timed blog, now I will feel much more prepared when I go to the library tomorrow. As reading is how I've decided I need to combat this rather... awkward season of my life. i LOVED gone girl...and totally want to read Gillian Flynn's other books, but heard they aren't as great. i also just like Gillian spelled with a "G", which is a good enough reason, right? you should totally read "What Alice Forgot" by Liane Moriarty..so good!